Cauda equina syndrome. 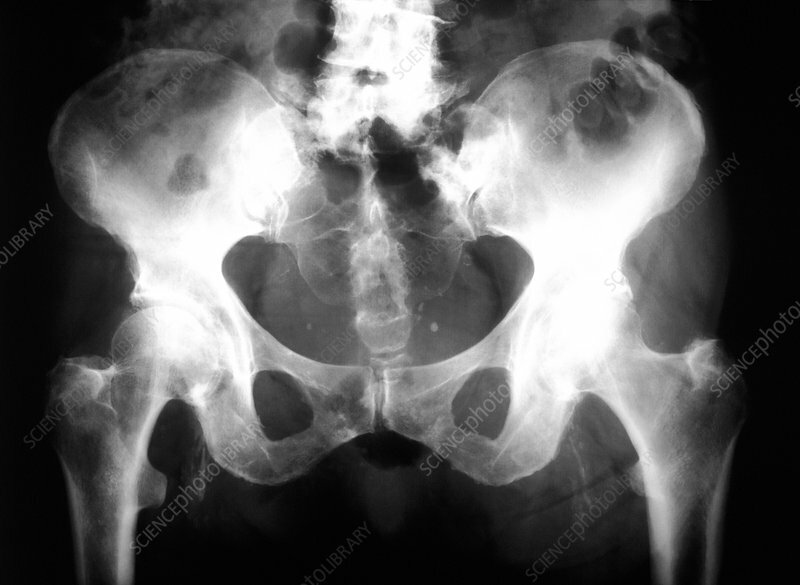 X-ray of the pelvis of a patient suffering from cauda equina syndrome due to a secondary tumour (not clearly seen). The tumour has caused weakening of the sacrum, the fused bones that form the base of the spine and its connection with the pelvis. The sacral area appears abnormally dark here. Cauda equina syndrome is a condition in which the cauda equina, the bundle of nerve fibres at the lower end of the spinal cord, are compressed. This causes symptoms ranging from lower back pain to bladder and bowel dysfunction and even paralysis of the legs. Treatment is of the underlying cause. Secondary tumours, which have spread from a primary site elsewhere in the body, have a poor prognosis.